The NOOK Tablet (and all NOOK devices) allows you to borrow and lend books through the LendMe program. 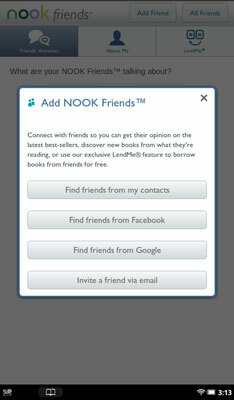 The key to the LendMe program is the NOOK Friends network — people who are in your circle. You’ve invited them or they’ve invited you. Once they accept an invitation, you can lend and borrow books. Make sure your NOOK Tablet’s WiFi system is enabled and the device is successfully connected to the Internet. Tap the Social Apps icon. On the Home screen or the Daily Shelf, press and hold the book’s cover. Tap LendMe in the menu that appears. In your Library, press and hold the book’s cover. Tap LendMe in the menu that appears. In the book itself, tap the center of the page to display the reading tools. If a small blue flag appears at the right end of the slider, tap the blue flag. Tap the LendMe button. Send an e-mail by selecting one of your contacts. If you haven’t entered any contacts or linked your account, select Contacts and press the Add Contact button. Post an offer on the person’s Facebook wall. You must have previously linked your NOOK Tablet to your Facebook account. Send a notification by Google Gmail if you’ve linked your NOOK Tablet to that account. While your book is loaned out, you can’t read it on your own device. Not all books can be loaned. Look for a LendMe badge on a book cover. You can loan a book just once, and for no more than 14 days. A user can return the book any time during the loan. If it hasn’t been returned at the end of 14 days, it’s automatically returned. You can only loan one book at a time; you have to wait for a book to be returned before you can make another offer. You can only lend from a registered NOOK Tablet to users of other registered B&N devices, or applications that run on other devices such as desktop or laptop computers, smartphones, and certain other tablets. You can lend a book from anywhere with supported wireless connectivity (including WiFi hotspots outside of the U.S., U.S. territories, and Canada). You can send LendMe offers to any e-mail address, but to accept, the recipient must have an e-mail address associated with a Barnes & Noble online account, and that means a resident of the United States or Canada. An offer expires after seven days if it hasn’t been accepted. You can’t loan a book that has been loaned to you. You can’t archive or save a borrowed book to the microSD card.